A book winner and why "Art is more than just pretty pictures". 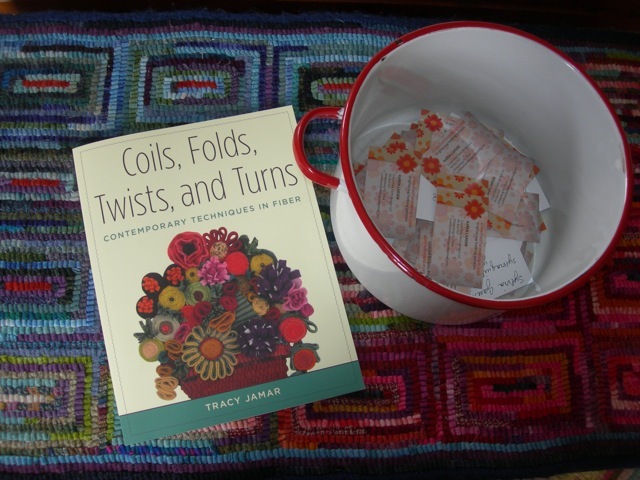 What a great response to my giveaway of the new book, Coils, Folds, Twists, and Turns by Tracy Jamar [© 2017 Stackpole Books]. This is truly an exiting book and I know the lucky winner will be as inspired by it as I have been. It has given me a creative idea for my next super secret rug. The winner is [drum roll please…] CINDY, who said, “Looks like an exciting fiber book. Thanks for the opportunity to win! Congratulations, Cindy, I will contact you for your mailing address and have this book sent your way. I have hooked more of my Resistance Rug and will do the background at Susan Feller’s Retreat Into the Mountains [WV] this coming weekend. I’m looking forward to this relaxing and rejuvenating weekend spent with other creative rug hookers. Apparently, posting a photo of my Resistance Rug on one Facebook rug hooking group may have offended some people and it was taken off. I’m not upset by that, just disappointed. and a bit confused. “Art is more than just pretty pictures”, as I often have said. I actually think my Resistance Rug is pretty attractive. One example of this is Picasso’s, Guernica , which I saw many years ago in NYC. It is probably Picasso's most famous work and political statement. It was painted in response to the Nazi's devastating bombing practice on the Basque town of Guernica during the Spanish Civil War. The tortured figures of both humans and animals create a very disturbing and chaotic scene. The large size of this piece [11'5" tall and 25'6" wide] makes the viewer become part of it. I’ve never forgotten standing in front of it and the effect it had on me. I will show more of my Resistance Rug in a week or two with a caveat for those easily offended. For those of you with a sense of humor, I do want to give a link to the incredibly creative fiber work of Salley Mavor, who has also ventured into the political arena with her Wee Folk Players. Visit her website for a world of her small handmade folks. There’s a lot of beauty out there and in using one’s Art to make a statement. Thanks to all who entered the drawing. I actually have ANOTHER BOOK to giveaway in a week or two, so stay tuned. Guernica by Pablo Picasso 1937. Black, gray, and white oil painting on canvas.